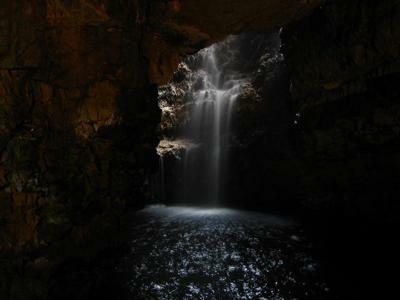 A small, but elegant waterfall plunging into a cave just outside the village of Durness on Scotland’s north coast. The cave itself is actually the inside of a cliff which is entered from the beach, where the ocean washes up inside a gorge. The gorge and the seafront alone would be worth the visit, but the waterfall here just adds another dimension. This picture was taken when I cycled around the north of Scotland in July 2007.